Veesible at latitudes atween +90° an −65°. Pisces is a constellation o the zodiac. Its name is the Laitin plural for fish, an its sembol is ♓ . It lies atween Aquarius tae the wast an Aries tae the east. 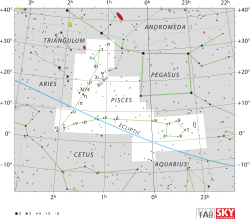 The ecliptic an the celestial equator intersect within this constellation an in Virgo. This page wis last eeditit on 2 Mairch 2014, at 02:03.